Of course FIDE constantly changes the rules so I may be mistaken but I have long understood that a rating and/or title tournament needs to be published on the FIDE calendar a month in advance and that has to be done by the National Chess Federation's rating administrator (who has been given access to the system). 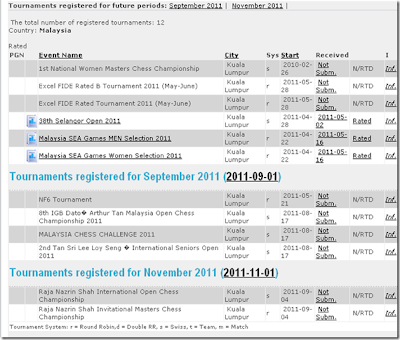 With the Raja Nazrin Shah Invitational Masters and Raja Nazrin Shah International Open, as in the previous KL Opens and in the many events overseas where I was the Chief Arbiter, the information needed to facilitate this registration was provided early to the National Chess Federation which in this case is the Malaysian Chess Federation (MCF). 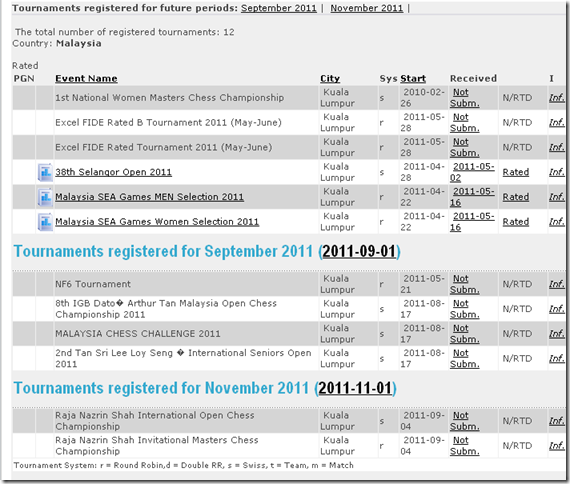 In fact I was informed that this had already been done by both the MCF Secretary and the MCF Ratings Officer but when I checked the FIDE website on Sunday morning, I saw, much to my surprise, that the various Malaysian Chess Festival events were indeed posted but not the Raja Nazrin Shah tournaments even though we certainly announced our events much earlier. After speaking to the MCF Secretary, the MCF Ratings Officer has now responded with the above screenshot saying that he has done his part but it is the job of the MCF Secretary to inform FIDE so that this information is also posted to the FIDE Calendar. My response to the MCF Ratings Officer, an International Arbiter no less, was of course to stop passing the buck and instead to work with his colleagues to get this done failing which it would not be a bad idea at all if he stepped aside and let someone else do this work as it is about service and not holding on to titles and positions!